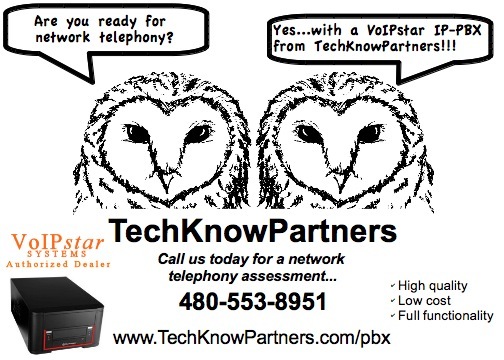 TechKnowPartners' specialty is network telephony - including using IP-PBX (Internet Protocol - Private Branch eXchange) systems for small-to-mid sized businesses and contact centers to increase productivity and reduce the cost of ownership of both communications and information technology investments. IP-PBX is becoming a popular business telephony technology with a lower total cost of ownership than conventional PBX systems. These systems are designed to deliver voice or video over a data network, and interoperate with the normal Public Switched Telephone Network (PSTN). VoIPstar IP PBX and Contact Center systems have the lowest total cost of ownership in the entire industry. With no ongoing licensing costs, and their ease of administration, VoIPstar systems help businesses keep telephony maintenance costs in check. Any other IP telephony system or contact center would cost 3 to 4 times as much to maintain. VoIPstar systems include all features needed by business-class users right out of the box, with no licensing required. It has an easy-to-use, customizable, operator console so that phone calls can be managed and integrated with other business applications. The systems include conferencing, call recording, call queues, auto attendant, and voicemail at one low price. VoIPstar systems are reliable and eliminate dropped and poor quality calls. The costs and benefits outweigh both traditional and hosted VoIP solutions. 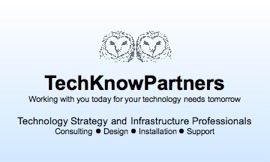 TechKnowPartners is a VoIPstar Systems authorized dealer. IP-PBX technology enables unified communications between voice and data applications, such as voicemail-to-email and application-to-phone integration.